What impact has the lower oil prices had on sub-Saharan Africa? Is a specialist international executive search and advisory services firm with a long heritage in the energy sector. For over thirty years we have worked across the Oil & Gas, Power, Utilities, Renewables and Nuclear sectors for developers, E&P companies, power generators and utilities. Our involvement across the development lifecycle from initial fund raising to project development into operations gives us a unique insight into the critical activities of the industry. This is complemented by a number of our consultants who have spent part of their careers in senior roles in the Energy business thereby bringing a wealth of knowledge and experience to the firm as well as a range of contacts within the industry. Specifically, during the last decade we have been involved in many projects across Africa working in the oil and gas upstream arena as well as the power and renewables sectors. Our clients for this work have ranged from multi-national, integrated energy companies to state power utilities and independent companies. At the time of writing we are working on over a dozen projects in sub-Saharan Africa alone. Over the past few months Grosvenor Clive and Stokes has been talking with clients and contacts across the energy business from operators in the upstream sector to power generators and financiers to gauge the impact of the current oil price volatility and likely medium term lower oil prices on the different segments of the energy industry in sub-Saharan Africa. This document distils those conversations into a review of the current thinking and takes into account data from other sources including a recent report from the International Energy Agency (IEA) World Energy Outlook – Special Report. Tim Shingler has worked in international Upstream Oil & Gas recruitment since 2003 specialising in senior subsurface and commercial appointments. He has, over the last couple of years, been expanding his area of involvement to the power sector working on generation, solar and renewable businesses. His clients include a wide range of energy companies from global multinationals to the independent oil producers. He also has a strong relationship with the Oilfield Services industry and the Consulting sector, where he has a particular expertise in recruiting for specialist advisory firms operating in Exploration & Production. Tim’s experience spans both the subsurface and commercial disciplines of his clients, finding business managers as well as senior technical staff. Tim has a truly international client and contact base having worked successfully on assignments in Europe, the Middle East, Asia and Australia as well as in Africa and the FSU. Prior to his career in executive recruitment, Tim spent many years working in the oil industry, firstly with Shell ExPro then as an oil analyst with James Capel and latterly as the Director leading the Petroleum Service Group at Arthur Andersen. Africa is a resource rich continent and the sub-Saharan region is perhaps one of the richest areas of the world for natural resources. It has an abundance of hydrocarbons, minerals and gem stones and conventional and renewable energy sources are widely available. It is recognised as one of the regions with significant growth potential over the near future with the IMF forecasts expecting East and West Africa to grow by about 6.5% a year for the next five years. This puts East and West African growth on par with the fastest growing region of the world, emerging and developing Asia. To put this in further context, over the next five years the IMF expects fifteen African countries, including Nigeria, Ethiopia, Uganda, Tanzania and Zambia, to grow faster than China’s economy. Within this big picture what are the key trends which will either facilitate or put at risk the realisation of this growth potential? Who are the potential winners and losers from a prolonged lower oil price? The region is an area for major foreign investment with Europe, India and China all seeking new opportunities to provide investment for major projects. Sub-Saharan Africa has significant reserves of oil and natural gas which will continue to produce revenue for those countries with these resources as well as providing employment and social improvements. Lower oil Prices will dramatically affect the fiscal revenues for the big oil producing nations (Nigeria, Angola and Gabon). For oil importing countries, the lower oil prices will have a positive effect on the balance of payments and could lower inflation. Off-grid power generation using diesel will be cheaper, positively affecting the peoples of the region. Transportation costs will be reduced as will the cost of many other refined products and petrochemicals used in manufacturing, power generation and agriculture. The energy industry continues to explore for more resources both onshore and offshore taking advantage of the lower costs of services. The abundance of renewable energy sources in the region will also allow the continent to thrive using solar, wind, hydro and geothermal resources creating cleaner and sustainable power supplies. The population is growing and this, together with a burgeoning middle class, will place even greater demands on resources and services. Provide good, stable regulatory environments that allow investors to make a profit while providing governments with regular and sustainable income. Provide open and transparent corporate governance at the heart of all governments and businesses. Provide an environment where growth and co-operation are seen as a way forward to develop the energy resources in the region. Provide a safe working environment where companies and their employees are able to work with high standards of personal safety and without fear of terrorist attack or kidnap. Provide a reliable power generation infrastructure. Africa is one of the world’s richest regions with significant natural resources and hydrocarbons which have been explored for and exploited for many years. Africa has two distinct regions, that of northern Africa – the five countries bordering the Mediterranean – and that of sub-Saharan Africa. The former region is regarded as mainly developed whilst the latter is largely undeveloped or developing. The one exception to this is the Republic of South Africa where significant steps have been taken to improve the infrastructure and quality of life. The vast majority of our subject area, sub-Saharan Africa, has limited infrastructure, a lack of modern power generation facilities and poor communication networks in the form of road and rail. Less than one third of the population of the sub-Saharan region has access to electricity. 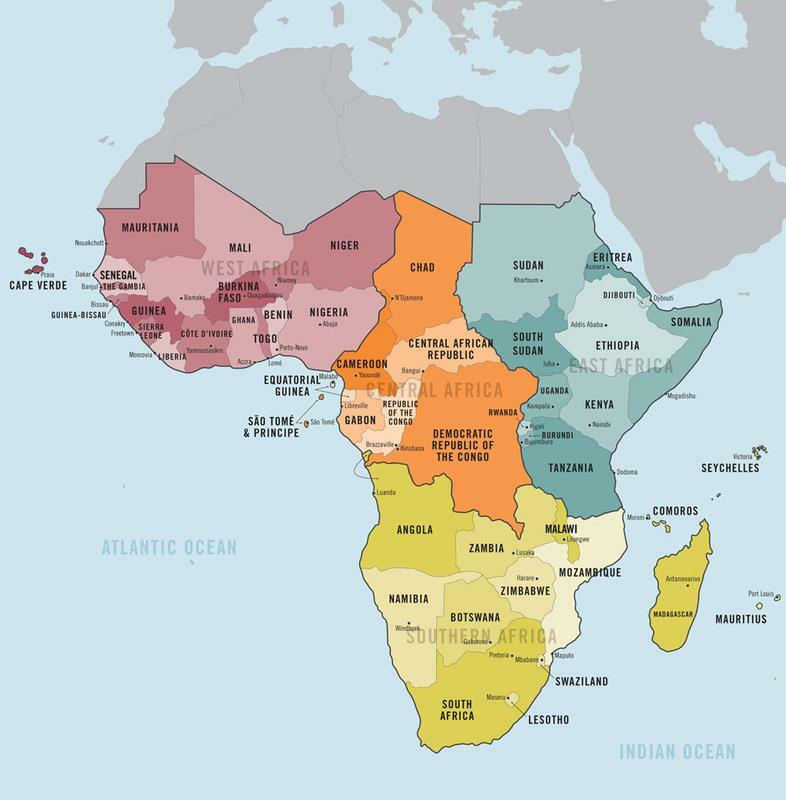 The continent has a population of over 1.1 billion people of which just over 900 million reside in sub-Saharan Africa. Nigeria has the largest population of 173 million and four other countries have populations of over 50 million, Ethiopia, Egypt, DR Congo and South Africa. The population of the continent has grown steadily for the last 50 years requiring evermore resources and infrastructure. In recent years many of the countries in the region have recognised the need for the provision of reliable, affordable and sustainable power supplies. Governments have changed regulations to allow foreign investment and ownership as well as encouraging inward investment. To realise the GDP growth potential, the African economies need a stable and affordable power supply to aid growth and allow businesses to develop unhindered. In much of sub-Saharan Africa businesses have to supply their own expensive diesel powered generators to support their activities, adding significant costs to the business. This is due to the lack of reliable grids and transmission systems that can provide uninterrupted electricity. Since 2000 energy use has risen by 45% according to the IEA report. The growth in the region is also fast developing a new middle class which in turn fuels future growth. The nascent middle class evolving in many countries in the region has money to spend on more consumable goods and leisure pursuits. This group is demanding more and countries need to tap into this growing economy to create jobs and increase government revenue. In addition, a strong level of governance is required to provide confidence to foreign investors. In a survey performed annually, the Corruption Perception Index published by Transparency International, gauges the perceived level of corruption in the public sector. In the 2014 survey of 150 countries reviewed only one African country, Botswana is in the top 40 countries whilst nine other African countries are in the bottom 20. Anti-corruption regulations which are enforced and effective will be of great significance to businesses and the wider populations. Towards the end of 2010 oil prices rose above US$100 per barrel and stayed there until the middle of 2014. By January 2015 Brent crude prices were below US$50 per barrel but recovered slightly in mid February to around US$60 per barrel and were trading in the mid US$60s at the time of this report. This near 50% decline means a corresponding significant drop in income for both energy companies and producing nations’ treasury departments. The latter suffers in two cases, directly through the state oil companies take through the Production Sharing Agreements/Contracts (PSA/PSC) and also declining tax revenue. The producing countries are endeavouring to increase production to compensate for the lower prices which in turn increases supply, keeping prices lower. The answer to the above question is split between those countries who are producing oil and those who are not. For sub-Saharan Africa’s big producers, Nigeria, Angola and Gabon, the lower prices have put a strain on the services provided by central government. A number of cost cutting measures have been announced in these countries and social levels have dropped impacting on an already poor population. On the reverse side, those countries which rely heavily on oil imports benefit from these lower prices, which in turn, have a direct impact of their balance of payments. Low crude import prices also have an impact on the price of diesel – widely used in Africa for power generation. Similarly, refined products are also cheaper in the form of fuel for transportation and the cost of fertilizers and petrochemicals for agriculture. The cost of exploring for oil has fallen significantly over the last six months. Oilfield service companies enjoyed a decade of high prices for their services as projects mounted and more equipment and crews were needed for seismic acquisition and well drilling operations. However, these costs have been reducing over the past few months as day rates for rigs both offshore and onshore have dropped dramatically as demand falls away. This means that seismic acquisition and drilling costs are nearer half the cost of those services this time last year. For the well-funded explorers in Africa, this is a great time to be adding value to their portfolios by drilling those company-changing prospects. For the cash-strapped smaller players, this drop in costs will have a limited effect as raising funds becomes ever more difficult. Also, for listed companies that are trying to borrow against their share price, this will prove difficult as the majority of oil shares have seen a significant drop in value. For the majors, many will continue with their work programmes however, getting partner approval for expenditure on operations may be hard if the partners are in financial difficulties. Additionally, for those operators of PSAs where deadlines are approaching, these may need to be renegotiated if work programmes are not being met as the PSA term moves close to the end of a particular phase. There is a view therefore that this is a time when some African governments need to look at their petroleum regulations and the fiscal elements of the PSA/PSC arrangements. In good times governments of producing nations make considerable income from the petroleum industry, now it is time to consider a longer term view. If oil prices remain low, what incentives are there for global companies to spend capital in high cost regimes? The industry needs a level playing field with a stable fiscal and regulatory regime offering an opportunity to make a profit without concern that if oil prices rise above US$100 again, new legislation will be brought in to take a larger percentage of the revenue. For those companies that are producing, developing or enhancing their oil and gas production, serious economic evaluation will need to be carried out alongside technical reservoir studies before investment is sanctioned. The future oil price will be an important factor in these calculations and accurate forecasting is a critical element in the risk analysis, but this is an imprecise science. In a recent report the World Bank forecasted the price of Brent crude would not rise to over US$100 until 2025 and in real terms the forecast oil price remains below US$85 for the next decade. Clearly, where production costs are less than this for existing producers, there is a limited impact, though expensive new developments may be affected depending upon the cost of capital. A further aspect for the upstream oil business to consider and factor in to their economic models is the rising cost of security and its impact on project economics going forward. Not only is the immediate risk of a terrorist attack difficult to predict and expensive to counter but also the long-term risk assessment of these problems is causing companies to look more closely at the viability of projects in the remoter parts of Africa. This combined with the political risks in many countries places significant strain on the value chain making it more difficult to deliver product at a profit. Governments and the energy industry, including the service companies, need to work closely together to find long-term solutions to these problems. Moreover, three other factors have to be considered (i) does the PSA licence term have enough life remaining for the reserves to be recovered, (ii) will the costs rise faster than the revenue and therefore is it cheaper to act now, and (iii) oil and gas projects have long lead times – therefore a long-term view is needed to assess for costs, income and the company objective. This is the time that the long-term view on the fiscal regime needs to be assessed and set against the forecast project economics. In this uncertain future and in order to ensure continuous activity and production, there needs to be more trust with a proactive and flexible approach on both sides allowing industry and nations to benefit from the value of the natural resources. The level of activity in Mergers and Acquisition (M&A) is expected to rise; in fact activity has already started. One commentator quipped ‘…there is not much in Africa that is not for sale…’ Those companies which have assets but limited or no access to additional funding or a line of credit, will be finding it hard to survive. The way forward for some is to farm-down or sell all or part of an asset to raise cash or obtain a “carry” through the next stage. Conversely, those companies with access to funds and/or the backing of PE/VC funds will be looking to acquire distressed assets to enhance their portfolios and their reserve bases. We may see some aggressive take-overs being announced if the oil price stays in the current area of around US$60 per barrel for a protracted period as forecast by the World Bank. We may also see an increase in activity at the global level of the market as majors look to acquire reserves via corporate acquisition. It would appear that Shell has made that move making an offer to acquire BG Group. Who will be next? One of the major stumbling blocks to economic growth in Africa is the lack of reliable, affordable and sustainable power supplies. The need for modern power generation has pushed investors and governments to look at a range of sources both conventional, mainly oil and coal with a little gas, and renewable sources varying from hydro, wind, solar and thermal to the burning of sugarcane. Reflecting the global drive to provide cleaner power, the move away from fossil fuels is evident and many now view renewable generation as the way of the future. However, today very few areas in the region have national grid systems or national transmission systems that provide reliable power sources. All of the countries suffer power outages on a regular basis. In reality, only some 30% of sub-Saharan Africa has access to ‘online’ electricity. Nigeria, the region’s most populous nation with the largest GDP, relies on a large number of small diesel- powered generation plants providing power locally. Companies setting up new businesses or manufacturing plants have to provide their own power which significantly increases business costs. A number of foreign investors have been heavily involved in building power plants in partnership with governments utilising local raw materials oil, hydro, coal and limited amounts of gas. Nevertheless, the most widely used power source remains diesel which is both imported and comparatively expensive. The commercial reality for many African nations is that the price of diesel is reducing as the price of the raw material is dropping. This is having a positive effect on the cost of imports which is good for businesses and individuals in the region who rely on its ‘off grid’ power generation. A diverse number of large power projects are now being developed using both wind and solar energy (PV and CSP) whilst geothermal projects are also being instigated. The World Bank points out that whilst the region has 13% of the world’s population it currently has only 4% of the world’s energy demand, it expects the demand to rise as increasing GDP will need the region to significantly increase power output over the next 25 years, providing access to the majority of the population. Whilst much oil is used for power generation the explorers have discovered huge reserves of natural gas around the continent which is under utilised as a power generator but could provide clean and highly efficient power. There is a major gas project in West Africa which takes gas from Nigeria to Benin, Togo and Ghana. The pipeline was built and is operated by Chevron on behalf of the West African Pipeline Company. This project demonstrates that countries and industry can work together to achieve significant success. The project was first conceived in 1982 and in 1991 the World Bank published a report stating that the project was commercially viable. By 2006 the 678 km pipeline was commissioned with first gas being delivered to Ghana in 2009. The gas powers a CCGT plant at the Takoradi Power Station providing power to Ghana’s national grid. The project demonstrates that although bureaucracy can delay business and increase costs, joint-ventures can and do work. There is hardly any nuclear power generation in Africa with the exception of a plant on the Western Cape in South Africa. Further studies are underway to consider the development of such plants in other areas. By comparison, in the continent’s largest economy Nigeria, only a small percentage of power needs are met by the national grid. Nigeria is Africa’s largest producer of crude oil with over 2 mm bopd but it is also the region’s second largest importer of refined products. The country exports the vast majority of its production with the remainder being refined in three state-owned refineries which are reported to be old and operating at around only 20% of capacity. We consider that the current low oil price will have only a limited effect on the longer term strategic investment in new and reliable power generation sources and infrastructure. However, the low diesel prices may delay some potential new developments. It will in the short term however have a direct effect on consumers as diesel and fuel oil will fall in price thus making off-grid power generation cheaper. It will also have an effect on transportation costs of raw materials and consumable goods, much of which are imported. Oil – will continue to be a major element in producing countries economic growth as demand for crude remains high. Although the price is currently lower than seen for a number of years, the revenue generated is extremely important to these countries’ economies. As more exploration activity is conducted in existing and relatively unexplored areas of the region, new discoveries will provide future income for the countries participating. It is expected that most of this crude production will continue to be exported to generate income whilst refined products are imported. This is, in part, due to the fact that the region has very limited refining capacity and what there is old and inefficient. Private investment will increase capacity but not to a significant level. Therefore, the question is why are countries not investing in new and efficient refineries to reduce the long-term costs of importing refined product? For exploration to continue governments need to establish a long-term plan regarding legislation, return on investment for companies and overcome the recent terrorist problems. This will provide a good hunting ground for the energy business and provide much-needed income for the nations of the region together with increased employment. Gas – over the past decade huge amounts of gas have been discovered both on the East and West coasts but very little has been utilised in power generation. In fact huge quantities have been flared during the production of oil, with the IEA stating that as much gas is flared today as is used in power generation across the region despite flaring restrictions in a number of countries. It estimates that over 1 trillion cubic metres of gas have been flared which if used for power generation, could have provided enough power for sub-Saharan Africa’s current needs for an entire decade. Natural gas has a strong future both as a feedstock for power generation and as an income generator through exports in the form of LNG. Large LNG/FLNG projects are extremely expensive; it is therefore expected that a number of projects will take time to come to fruition if the oil price remains low. However, a number of projects are already underway in selected areas including Nigeria, Equatorial Guinea and Angola while on the east coast, projects in Tanzania and Mozambique are being reviewed as the reserves found are of world-class scale. Offshore in Tanzania and Mozambique companies are looking at developing the massive gas reserves which have been discovered over recent years. Whilst much will be exported as LNG, it is expected that there will be power generating facilities that could be shared along the East African coast. If companies and governments can work together, the potential for many more of these large industrial projects is significant in Africa but it will need countries and companies to put aside fears and years of mistrust to develop business opportunities that benefit both countries and industry alike. The Western Africa Gas Pipeline is an example of this co-operation working for the benefit of nations and private enterprise. The future of African LNG is difficult to assess in the short term but in the longer term opportunities in Asia and Europe will provide a ready market for the product. In Europe this will be especially true if there is a move away from Russian gas and in Asia the proximity of India with its pace of economic growth should provide a significant opportunity. The demand for power will continue to rise driven by population increase, demographic change and economic growth. Hence, the development of both new renewable and conventional power plants will increase despite the fluctuation in the oil price. All around Africa, new projects are starting or in advanced stages of planning. Foreign investors see Africa as a major growth zone as companies and countries assess the potential of new power projects. Chinese companies in particular have seen the potential of Africa with major investments both in power projects and infrastructure. The motivation for this investment is driven by access to the region’s natural resources. Many UK companies view Africa as a major investment opportunity either for sales or as investment opportunities for Private Equity companies and Venture Capital funding. In Ethiopia, building has commenced on Africa’s largest hydroelectric and geothermal project which will triple the country’s generating capacity. In Kenya, work is underway to construct one of the world’s largest geothermal projects in Hell’s Gate National Park in the Rift Valley. Further to the north of the country, private investors are building Africa’s largest wind farm. Wind farms and solar projects are also being developed in South Africa with foreign investment, as part of the country’s massive expansion of generating capacity. In Ghana, the world’s fourth largest solar Photo Voltaic (PV) project is being built in the western region of the country adding significant new power to the area in 2015. The cost of renewable energy plants continues to fall allowing for cheaper electricity to be produced which in turn means that a greater percentage of the population has access and business can operate more cost effectively. Onshore wind farms have reduced in price considerably offering direct competition, in certain ‘high wind’ areas, to conventional power generation. Similarly, PV cells are now much more cost effective offering local power generation to areas too far from grid connection. The size of solar farms is now increasing to offer power to the grid in peak demand times for industry as well as domestic use. The range of energy sources has increased considerably in recent years offering modern, reliable and affordable power to a much greater number of people and a wider range of industry. If countries can provide affordable and uninterrupted power, the economies of the region will rise significantly as will the quality of life for the population. Grosvenor Clive & Stokes has over 20 years’ experience of recruiting in the Oil, Gas, Power and Infrastructure sectors in Africa. We understand the challenges involved finding high calibre, qualified local recruits, in attracting experienced international workers and in accessing the African diaspora with a view to them returning to the Continent. Our longevity in the industry says a lot about our integrity, track record of success and commitment to the Region.